...we fell into line and started for the Ford, crossed over and for the third time started for Cumberland Gap. ... Here we commence the ascent of the Pine Mountain. Toiling over this and the first and second Log Mountains beyond, we are within a mile of a curve in the road that will again bring us in sight of the enemy's works; when we turn to the left again on the same road that we traversed on our last previous expedition. Marching steadily on, with orders to make as little noise as possible, crossing the Harlem [Harlan] road and entering a wild and almost uninhabited region, following paths where no wheeled vehicle could proceed, where the field and staff were compelled to dismount and lead their horses. The further we advanced the less distinct the paths became until they entirely disappeared and we only had the guide to depend on. Night came and we were ordered to bivouac without fire among the rocks. During the night a thick fog settled over us, and the early morning found us groping our way through this toward the summit of the mountain, which we reached after a laborious march of about an hour. We were now on top of the main ridge of the Cumberland, about two miles east of the fortifications of Cumberland Gap. ... Our nerves quickened in anticipation of a brush with the enemy, as we now rapidly narrowed the distance between them and us. Just beyond a long depression I the mountain summit, the picket guard of the enemy suddenly appeared, fired at our advance guard and fled. Our whole force composed of the 14th Ky. Infantry and our Regiment increased our speed which soon brought us within short range of the most elevated fort and earth works at the Gap. Long Tom (the name the boys gave the iron thirty-two pounder in the fort) belched away at us until we got so close that our bullets kept the gunners from working the piece. A brisk fire from their rifle pits compelled our boys to take shelter behind rocks and trees, where we kept up a lively fusillade for more than an hour, when we were withdrawn and again took up our line of march for camp. This skirmish was not without bloodshed on our side. Harbaugh, of Co. K, received a bullet in his forehead that resulted in his death a few days afterward. Barnhill, a rosy faced boy of Co. G, was shot through the cheek. The wound bled profusely but was not serious. The year following at the seige [sic] of Vicksburg he was killed. Apr 28th. Made another reconnaissance to Cumberland Gap in force, and going on two different roads the 16th taking the left ascending the mountain and getting within 1/2 mile of the enemies works. 29th. Skirmishing all day: One man got a slight wound in the cheek, and one a mortal wound in the forehead. The force returned to camp on the 30th making a march of about 35 miles in all. Tuesday, April 28: Get up at three o'clock A.M. Start to Gap at 5 o'clock. 2 o'clock P.M. stop near the Gap and stack arms. Sleep without tents. Tuesday, April 29: Get up before day. Make coffee, eat breakfast, and start forward. Stop on mountain till fog clears away. Go into Virginia. Go up close to the breastworks and have sharp skirmish. Three of our men wounded. Return to the place we slept the night before. Stay there till morning. Wednesday, April 30: Start for camp. Wait on Gen. Carter's brigade. Start on a course to camp. Period map showing the approximate route of the 16th Ohio on its scouting mission from Camp Patten to Cumberland Gap. 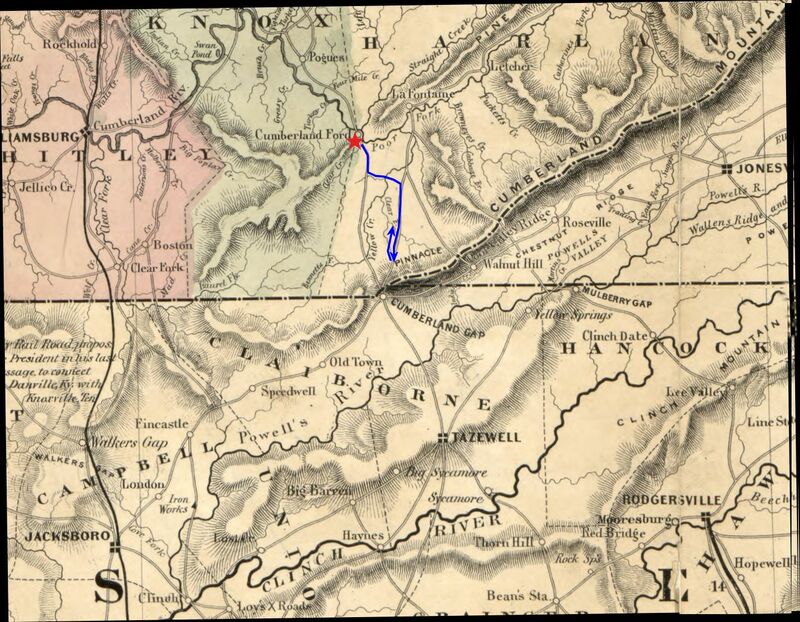 Based on other maps of the time, it is possible the regiment left the main road, known as The Kentucky Road, marched east along Mill Road then south southeast along the Harlan Road to Cumberland Gap.